Richard Plom aka Mystical Sun makes a panoramic, celestial brand of psy-ambient and his distinctive tracks like the exquisite "Nebulous Mist" have graced many chillout compilations released since the mid-1990's. His own full-length albums are relatively modest in number but many of them are masterful. San Francisco musician Mystical Sun (Richard Plom aka Richard Mystic) makes a panoramic, celestial brand of psy-ambient and his distinctive tracks like the exquisite "Nebulous Mist" have graced many chillout compilations released since the mid-1990's. His full-length albums are relatively modest in number - a yawning 13 year gap separates his first and second albums, for example - but many of them are masterful. 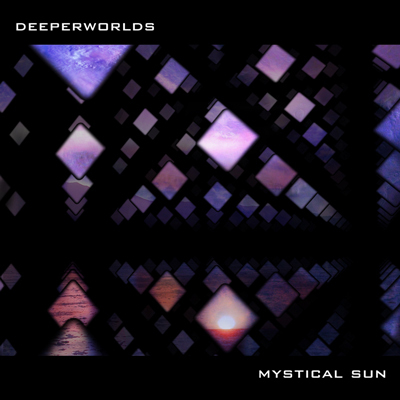 His second album Deeperworlds (2007) remains his masterpiece. It comes in two main styles: big spacious ambient dub, breaks and muted 4/4 doof on the one hand, and beatless sound collages infused with Zen-like calm on the other. The music full of glistening textures yet has a rounded, soft production sheen and it's a testament to the treading the e-music road less travelled, i.e. finding and creating original sounds and building his own synths. Among the rhythmic tracks "Halo" is outstanding in the way it layers 3 or 4 melody lines at once, adding loads of tiny details like jangling zither and choral vocals. "Cloudbursting" is another gem, a rousing tune led by an electric guitar arpeggio and a groove that sounds a bit like 90's big beat gone psychedelic. The gentlest moments are nearly all in the album's last third. These tracks are highly visual ambient pieces, often with environmental effects and blessed with an exotic, pristine "lost paradise" kind of beauty in the vein of UK duo Ishq and the best new age artists. Five other Mystical Sun albums are also essential listening. Energy Mind Consciousness (2008) is a kind of cousin of Deeperworlds though it's generally more subdued, even dark ambient at times. It's layers reveal themselves beautifully with repeated listens. 26000 (2012) is beat-orientated in the style of the more energetic tracks on its predecessors but this time with tablas, sparkling sitars and other Eastern instruments coming to the fore. Again, his efforts to create original samples and sounds pays off; the album is melodic psychedelic downtempo with his own very personal signature. More recently he's been crafting albums drawn from extended late-night improvisations and experiments. The best moments from these explorations can be heard on a pair of releases, Panoramic (2017) and especially Altitude (2017), the latter being arguably the best thing he's done since Deeperworlds. If you're up for some truly epic psychedelic space adventures (tracks of 30 minutes-plus length) then Music For Supernovas (2016) is also recommended, an album that free-ranges across everything from fuzzy space melodies to walls of pure abstraction.